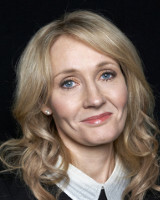 J K Rowling 31 July 1965 British Peter Rowling Anne Volant Rowling T.V writer, Author, Film producer, Novelist Novelist, screenwriter and film producer, best known as the author of the Harry Potter fantasy series which become the best-selling book series in history and won multiple awards. She gained multi-millionaire status within five years and one of the best-selling living in United Kingdom. A list of popular j k rowling quotes are given below.